—We will start with the accepted evidence base for warfarin. Myth 1: Rhythm-control strategies prevent stroke. Myth 2: Running the INR on the low side (< 2) is an effective strategy for lowering the risk of bleeding and still getting some stroke prevention. 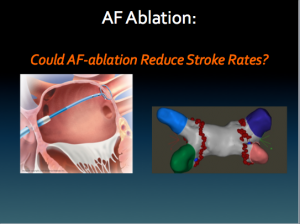 Myth 3: Intermittent AF confers less stroke risk than permanent AF. Myth 4: Aspirin offers the AF patient (elderly or otherwise) a safer and effective strategy of stroke prevention (BAFTA Trial, AVEROS Trial, Danish Registry study (10-11)). Which is the best validation score to determine stroke risk? CHADS2 versus the more nuanced CHA2DS2-VASc scheme . —What is the role of dabigatran? Why is ICH risk so low? —Can AF ablation prevent stroke? 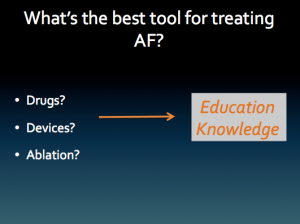 As a rhythm control strategy, we know AF ablation beats AADrugs, but does AF ablation improve hard outcomes like stroke and death? Impressive chartsmanship. That required a boat load of reference material and data reduction. I read the PDF file and absorbed as much as a layman might expect… maybe a bit more. However I think I am getting the viewpoint that Pradaxa is superior to Coumadin… Is that right? I might add that I take 4 mg qd and am 72. I have had a PVA and am doing well. I am still taking 500 mcg Tikosyn bid as I have had a increase in NS VT over the past year… 7-8 per quarter. I have had trepidations about the Pradaxa as I originally read there was a increased risk of intra cranial bleed but am not getting that from the stats you published. I am seeing my cardio next month and wonder if I would be better off with Pradaxa… any comment? Thanks for slide #70. Hope you don’t mind if I print it and post it on my fridge. Why does being female give you an automatic point on CHADS2? I keep seeing it, but I don’t see why that is. There are some reports of interaction between Multaq and Pradaxa, whereas the Multaq can cause an increase in the blood plasma level of Pradaxa to the tune of up to 1.7 to 2 times that of Pradaxa alone. What is the current thinking regarding this and are there any new guidelines or words of wisdom? That may be part of the reason I’m having such a tough time with these meds. It looks like dronedarone increase dabigatran effect, by increases absorption. I have not heard that this causes clinically important consequences. If dronedarone use expanded, it’s possible this could become a problem. But dronedarone use does not look likely to increase. John, could you clarify something for me in your report? Several times, LV dysfunction, or words to that effect, is mentioned. I’m assuming you mean left valve dysfunction of some nature. Could you explain the term and how it’s used in this context? Also, are you referring to conditions such as mitral valve prolapse with regurgitation? If so, would that apply to any regurgitation or to severe regurgitation? I’m not clear on this point. LV dysfunction refers to weakening of the heart muscle. Valve disease is one reason for a weak heart muscle, but there are many others: heart attack being the number one cause in the US. Long-standing high blood pressure, persistently high heart rates (AF) and inflammation from viral infection are another three. Thank you once again, Dr. Mandrola. Regarding your first response, I believe my science experiment with dronedarone will have to come to an end soon, as the side effects are getting ridiculously obnoxious. I’ve been a brain dead lab rat long enough. As to your second comment, that is very helpful. According to your presentation. I’m better able to assess my risks. Looks like my CHADS scores using both methods are quite low (0 to 1) – something I need to review with my doctor. As an aside, the more I read and study about the electrical nature and “mechanics” of afib, the more I see how closely the problem might resemble an equivalent problem in electrical and electronics circuits – excessive background noise, and corrosion causing electrical leakage and creating alternate pathways between two circuit paths as 2 examples. In electronics, we remove the offending corrosion between the paths on a circuit board to reduce the unwanted leakage between the circuit traces. In your world, you ablate the alternate paths. We might lower the voltage between two points to stop an arc, you might adjust the rate to stop (or at least minimize) the arc. I also equated my electrocardioversion to a good old computer reboot! At least my reboot worked without having to install all of the latest security updates.